Spin Station Casino Review | Exclusive 20 No Deposit Bonus Spins on sign up! Spin Station Casino is managed by White Hat Gaming Limited on behalf of the Caddell Group. This company is licensed in Malta (MGA) and the UK (UKGC). Spin Station Casino is an online NetEnt casino with quite a few sibling casinos, such as: Miami Dice, GrandIvy Casino, Spinland Casino, Casimba, and Spinrider Casino. All these casinos give great welcome bonuses and offer a huge selection of games. Spin Station has games from the casino industry’s top software providers, such as: NetEnt, Microgaming, NextGen, Quickspin, 1×2 Gaming, Leander Games, and Evolution Gaming. If ‘Spin Till you Win’ sounds like your catch phrase, then Spin Station Casino is the most suitable online casino for you. The Spin Station Casino Review below will give you the latest updates regarding the welcome bonuses on offer, as well as how to get your hands on some Exclusive No Deposit Bonus Spins on registration. 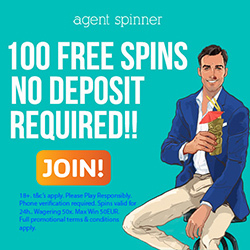 New players at Spin Station Casino are eligible to sign up for an Exclusive 20 No Deposit Bonus Spins. New players residing in the ROW get a whopping 200% bonus up to €/$2000 + 50 Bonus spins when you make your first deposit. Deposit a minimum of €/$20 or more to qualify for these Welcome bonuses. New players residing in the UK get a huge 200% bonus up to £2000 + 50 Bonus spins when you make your first deposit. Deposit a minimum of £20 or more to qualify for these Welcome bonuses. New players must be 18 years or older to sign up for a casino account. Full Terms and Conditions apply. Click here. Wagering requirements for the Welcome bonus is 35x (deposit + bonus). The max bet is €/$/£5 when bonus money is active. Winnings from No Deposit Bonus spins are capped at €/$/£50 and standard wagering requirements must be met before a withdrawal can be made. Winnings from bonus spins are capped at €/$/£100. Different games carry different percentages in fulfilling the wagering requirements: Slots count 100%, except for the following which count 20%: Blood Suckers, Dead or Alive, Devils Delight, Kings of Chicago, Jackpot 6000, Lucky 8 Line, Mega Joker, Super Nudge 6000, Big Bad Wolf, 300 shields, Secrets of the stones, and Victorious. Table Games, Video Poker, and Other games count 0%. Scratch cards and Keno count 100%. Players residing in these countries may not accept bonuses or play at the casino: Armenia, Poland, Greece, Cyprus, Hungary, Croatia, Ukraine, India, Russia, Czech Republic, Slovakia, Slovenia, Estonia, Georgia, Lithuania, Latvia, Bosnia and Herzegovina, Macedonia, and Serbia. The deposit options at Spin Station Casino are: Visa, Mastercard, Paysafecard, Neteller, Skrill, dotpay, Trustly, Giropay, Sofortuberweisung, Interac Online, and Bank wire. You can deposit using the following currencies: USD, EUR, GBP, NOK, SEK, NZD, AUD, and CAD. English, German, Norwegian, Swedish, Finnish. Afghanistan, Albania, Algeria, American Samoa, Angola, Australia, Austria, Belgium, Bolivia, Bulgaria, Cuba, Denmark, Ecuador, Estonia, Ethiopia, France, Ghana, Guam, Guyana, Hungary, Indonesia, Iran, Iraq, Israel, Italy, Kenya, Lao Peoples Democratic Republic, Latvia, Lithuania, Malta, Myanmar, Nigeria, North Korea, Northern Mariana Islands, Pakistan, Panama, Papua New Guinea, Poland, Réunion, Romania, Russia, Sao Tome and Principe, Singapore, Slovenia, South Africa, Spain, Sri Lanka, Sudan, Syria, Tanzania, Thailand, Turkey, Uganda, Ukraine, United States, United States Minor Outlying Islands, Vietnam, Virgin Islands (U.S.), Yemen, and Zimbabwe. For any queries, contact customer care via Live Chat or Email.